Please note this is a Manga Free Write Up, we will only be discussing the anime and I’d ask that we keep manga spoilers to a minimum in the comments. Anything explicitly spoilery will be deleted. As the episode opens the threat of the Titan’s are beginning to reach the inner walls. As such the Survey Corps. still recovering and assessing the meaning of the Titans in the wall revelation are pressed into action. Staying true to her(?) character Hange is reluctant to let any minute go to waste as she analyses the Titan crystalline substance that is now highly likely to be make up the walls. In effect as Armin theorized it was the Titans themselves protecting humanity from fellow Titans. As the Survey Corps. begins to move out a special team formed on Commander Erwin’s orders heads out with them. Comprised of Armin, Misaka, Eren, Hange, and Levi accompanied by the Wall Priest. There Hange informs the three young members of the Walls dark secrets and how the Wall Cult and its Priests have seemingly been aware of it for all this time which obviously horrifies the young recruits. To break the Priest Hange’s plan is a simple one expose him to the reality of the Titans and see if his “faith” is enough to sustain him in the face of true terror. Following this the episodes focus shifts to the true star of the episode Sasha Blouse the Potato Girl! With this episode we see some of Sasha’s backstory which helps inform her character and her quirks. Sasha is originally from a long line of hunters, however due to the attack on Wall Maria more settlers have been moving in making game harder to find. As such hers and her fathers livelihood and traditional lifestyle is threatened. Her father engages in a philosophical debate on the nature of humanity with Sasha. Who take the stubborn approach that their traditions are more important then coming together to help the others displaced by the Titan attack. Her father clearly disagrees. 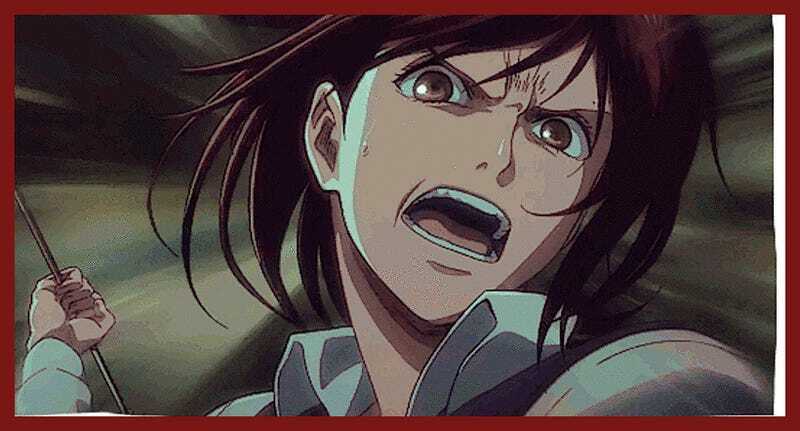 In a later flashback we see Sasha in a bit of an altercation with Ymir during training. Where it is revealed that Sasha is seen as a bit of an idiot (well duh) and a country bumpkin, as Ymir verbally berates her Krista her friend stands up for Sasha. In the face of all this Sasha just laughs, while she may not be the sharpest tool in the shed its clear she is a good person at the very least. Something that can not exactly be said about Ymir all the time, though Krista remains adorable as always. Back in the present as Sasha races to her village revealed to be near the Titan attack last week she finds a village has popped up in the three years she has been away. The village is dessert except for a scene of abject horror as a 3 Meter Titan is slowly munching on the leg of an older women, however they are not alone. Traumatized a young girl is watching as her mother is slowly being devoured by the miniscule Titan. While Attack on Titan has always been big on bodily horror and the horrific nature of the Titans I can’t seem to recall it ever lingering that much on the act of devouring a human. The scene was actually very reminiscent of another from a very similar manga and anime Claymore, it was actually so similar I could almost see it being intentional. That being said if Attack on Titan wants to use more visual ques from one of the most stylish (and a personal favorite of mine) action horror manga/anime I’m all for it! Sasha knowing the mother is lost rushes by the Titan to save the kid after a failed attempt to hack the Titans head off. However due to Sasha’s unsettled nature she spooks her horse and it runs off leaving Sasha on foot and without any weapon due to the rushed nature of their deployment. On foot Sasha escapes with the child from the village however the 3 Meter is in “hot” pursuit, well more like a leisurely pursuit at this point. Luckily Sasha was able to find a Bow and four arrows. Deciding she needs to delay the Titan if her and the child are to have any chance of escape she goes into full on Huntress mode and shows her ample ability with the bow scoring a bullseye on the Titans neck, however unsurprisingly the attack is woefully ineffective. Sasha decides her only chance is to blind the Titan by taking out its eyes however with only three arrows her margin of error is slim. After missing the first shot she manages to connect with the second one. However by now doubt has crept into her head with everything riding on one arrow Sasha decides to throw caution to the wind and lunges for the 3 Meter Titan stabbing the thing with the arrow in its lone good eye. However she is caught by the Titan and using the magic power of plot armor! I mean... slippery blood Sasha literally slips out to safety. Where she luckily enough meets a group of riders including her thankfully alive father, who tells her how proud he is. As the episode comes to an end there is one last shift in focus as Connie is racing towards his own village. When he gets there he sees his house has been crushed by an oddly deformed Titan, who’s legs are too weak to support its massive girth and ribs sticking out. The episode ends of a cliffhanger, how on Earth did a Titan that cannot walk get there? As I said above the second outing for Attack on Titan Season 2 was another satisfying entry into the series and with ten episodes to go I’m actually really feeling good about its potential. While the manga material will provide challenges for the anime going forward Studio Wit has so far handled these first two episodes quite well, despite by and large being smaller events in the grand scheme of things. Sasha’s fight alone with a Titan without any of the cool acrobatics the series is known for has become on of the more satisfying fights in the series for me. The dread and insecurities Sasha was feeling was all palpable, you understood her and felt for her. It is this emotional connection and resonance with a character that elevates a series from good to great, if there is more of this in the pipe I think fans of Attack on Titan and even sometimes critics such as yours truly are in for a treat. Until next week all!